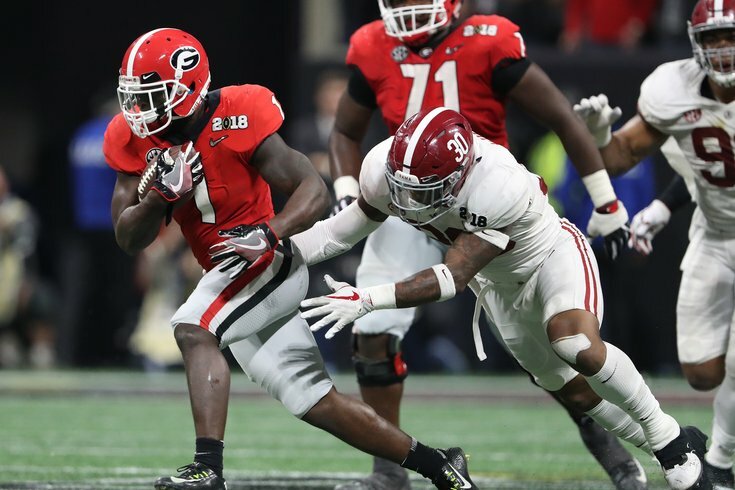 Sony Michel is the type of three-down back Doug Pederson would love to have in his offense. With the NFL Combine in the rear-view mirror and the Philadelphia Eagles' big trade on Wednesday, let's throw out our second Eagles-only mock draft of the offseason. Speaking last year at the NFL owners' meetings, Doug Pederson was asked what he values in a running back. "I think that position has changed quite a bit over the years," Pederson explained. "I think that obviously every team, you look for guys that, are they a three-down guy? A guy that can play first, second and third down? Guys that are mobile in the sense of (moving running backs) out of the backfield. We do so much with empty sets (no backs in the backfield). A lot of teams do a lot of empty sets. Route-running ability (is important). Obviously the skill set of running the football, I mean, that’s what they do. Obviously, they have to be able to carry the ball and run. "There’s so much versatility in backs nowadays from again, those empty formations, out of the backfield, spreading the field, those are the things that we want to see. (In terms of) physical traits, can they run between the tackles? Are they physical enough to run between the tackles? Can they stretch the field in outside zone? Every run game plan every week changes. Sometimes you’re going to be more inside the tackles, and then the next week you might be outside the tackles, so you have to have the versatility to do that. So those are things we look for in these backs." Run outside: Eh, maybe not a major area of strength, but he can do it. The Eagles' future at the running back position is a little uncertain. LeGarrette Blount may or may not be back. Most (self included) would lean toward the latter. Jay Ajayi will be back next season, but he is in the final year of his deal. The Eagles have openly acknowledged his knee issues. It's very possible Ajayi won't be on the team in 2019. Corey Clement proved to be a very valuable third-down back as a rookie. Michel could contribute as a rookie along with Ajayi and Clement, and then take on a much larger role in 2019 and beyond. Warner is among the better linebackers in this draft in coverage, which is what Jim Schwartz prioritizes in his linebackers. He doesn't have huge tackle numbers (86 and 87 in 2016 and 2017, respectively), but he makes plays in the passing game, as he had 4 INTs and 11 pass breakups the last two seasons. In the highlight reel below, watch how many plays he makes on the perimeter in open space against wide receivers with the ball in their hands. Warner plays a lot more like a safety, but he has the size and aggressiveness of a linebacker. He's a candidate to fill the role that could be vacated soon by Nigel Bradham. Presently, most draft sites have Warner projected as a fourth- or fifth-round pick, so we have him here, but more realistically, the Eagles may need to pick up a three to be able to draft him. When the Eagles signed Torrey Smith last offseason, they were looking for a speed receiver who would keep opposing defenses honest by making safeties respect the possibility of the deep ball. Smith made some plays, but he was too inconsistent, as he struggled with drops and would go long stretches without making plays. Boise State WR Cedrick Wilson doesn't have ideal deep speed, but he makes plays down the field. In just two seasons, he racked up over 2600 receiving yards, and averaged 19 yards per catch. Unlike Shelton Gibson a year ago, Wilson runs the full route tree, makes guys miss after he has the ball in his hands, and I love his tenacity as a blocker. The Eagles are already down one receiver after trading Marcus Johnson. They could be down another one soon if they move on from Smith. Wilson could be an immediate special-teams contributor and guy who competes for meaningful reps in the offense. Fumagalli is a redshirt senior who has put up decent numbers in a run-dominant offense at Wisconsin. In 2016, he had 47 catches for 580 yards and two TDs. In 2017, he had 46 catches for 547 and four TDs. Still, Fumagalli is a skilled receiver with great height who is fearless over the middle, and grinds for yards after the catch. Fumagalli isn't the most athletic tight end in this draft, but he's a great effort player who is willing to block. In that respect, he reminds a little of Brent Celek. In the pros, Harrison is going to have to put on more weight, and he's going to have to be coached up by an NFL staff before he sniffs the field in a meaningful game. He's something of the "Blutarski" of the draft this year, as he was playing college football as far back as 2011 at Contra Costa Community College. I couldn't find an official age for him, but he's old. He has off-field concerns, as he transferred from that JUCO school to Texas, where he missed a year due to suspensions, before landing at West Georgia. Still, he makes a lot of sense for the Eagles, who don't need immediate help with a stacked group at OT, but will have tackle needs down the road whenever Jason Peters retires. Harrison is a highly athletic developmental prospect that Jeff Stoutland can try to work his magic with over the next couple years. Thomas had a very weird combine. On the one hand, he put up a pathetic four reps on the bench press, and he ran an awful 4.64 40, which will unquestionably scare off a number of teams. On the field, Thomas wasn't nearly as good in 2016 and 2017 as he was in 2015. CFB Film Room had him down for seven touchdowns allowed in each of the last two seasons, with just three interceptions. That's very bad, clearly, and it's why he could be available in the seventh round.